The Serious Games Market blog showcases a number of interesting edugames, and I thought that I should try some. One of the posts linked to an interesting-sounding site called iCivics.org, which has a number of educational games that are designed to teach kids about the way the US government works. Some of the games were relatively good. Others were dreadful enough that even with a designed playtime of half an hour or even less, I couldn’t bring myself to play them to the end. One in particular reminded me of old point-and-click adventure games in the worst possible ways: not allowing the kinds of actions that would have felt the most logical, ultimately leaving “try using everything on everything” as the only way to proceed. Few were anywhere near as pleasing to play as a good entertainment game. But still, there were some entertaining ones, and several that would be interesting to analyze. I have to keep running around this map to get laws executed. The distance between places matters. 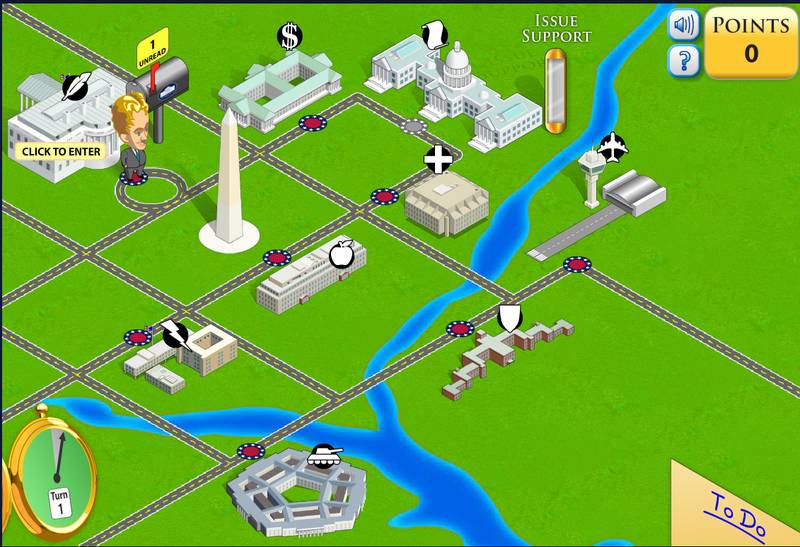 The first game that I tried was Executive Decision, in which you take the role of the President of the United States. In practice, this involves running around a minimap of Washington DC, where letters keep popping up in your mailbox at the White House. Mostly, the letters contain new laws that Congress has sent for you to sign. If they’re good laws, you should sign them and then take them to the relevant government building to be implemented. If they contain bad parts, you should flag those parts as bad and veto the bill, in which case they will soon come back without the bad parts. Occasionally you’ll be asked to fly to a meeting in a foreign country, to go over to the Pentagon to choose the most appropriate branch of the military to deal with a conflict, or to go to the Congress to hold a speech to bolster support for your pet issue. All of this requires running around the map, and running around the map takes up time, which you have a limited amount of. So Executive Decision is basically a resource-management game where you need to plan your moves as efficiently as possible, in order to maximize the amount of actions you can take. This kept me moderately entertained as I played it, and it was short enough that I didn’t have the time to get bored, though I wouldn’t call it a crowning moment of fun. Now, what was the game intended to teach, and what does it actually teach? The game probably does an adequate job of teaching most of those. I’d expect the items 3-6 and 8 to be remembered the best, since they are things that you spend the most time doing. The others require somewhat more attention – you might forget that the guy giving you advice on what to do was called the Chief of Staff, or that the part at the very start of the game where you choose your pet issue was the State of the Union speech. People should be expected to learn the game, not the reality, and that will especially be the case when the game diverges from reality to make it more fun/interesting/memorable. If you decide that the most interesting way to get people to play an interactive version of Charles Darwin collecting specimens is to make him be a trainer that battles those specimens, then it’s likely they will remember best the battles, because those are the most interesting part. One of the research projects I got to see up close was an educational game about the Chesapeake; if I remember correctly, children got to play as a fish that swum around and ate other fish (and all were species that actually lived in the Chesapeake). If you ate enough other fish, you changed species upwards; if you got eaten, you changed species downwards. In the testing they did afterwards, they discovered that many of the children had incorporated that into their model of how the Chesapeake worked; if a trout eats enough, it becomes a shark. The President needs to physically visit different government departments in order to delegate the task actually of implementing various laws. While doing this, it is important for the President to plan his route in a way that lets him visit many departments in a very brief time. It’s better to be an Education President than a Security President, because the Department of Education is physically closer to the White House than the Department of Homeland Security is, so it takes less time to run between the White House and the Department Education. Good laws have noble-sounding goals, and the President never needs to worry about unintended consequences. Nor is the monetary cost of a law an issue. Even though some laws are titled “deficit reduction” laws, the only difference is in their name, and in the fact that they belong to the Treasury’s jurisdiction. Congress will randomly invite the President to hold a speech for them, and the President can win over their support for his pet issue by holding a speech filled with platitudes each time, until they start sending him nothing but bills related to that issue. Having a foreign country declare war on the US is inconvenient, because then you have to keep running over to the Pentagon to tell your generals how to deal with the constant acts of aggression, when you’d rather be promoting your pet issue. The President can end wars by waiting to be invited to meetings in other countries and then flying over to those meetings sufficiently many times. You may think that I’m being facetious here. But these really are things that one learns when playing the game, because you need to learn them to play the game well. For the same reason, they’re things which are quite likely to stick to the player’s mind the most. Of course, the player also remembers the context of the game, and may be able to use other knowledge to figure out that which parts are only specific to this game and untrue in real life. So hopefully nobody learns many untrue things from Executive Command. Also, many of those points, such as the possibility of Congress overriding a Presidential veto, are addressed in the other games. But the point is that the game mechanics are a large part of what the player’s focus and attention are on. If the mechanics are divorced from the actual educational content of the game, that means that part of the game’s educational potential is wasted, since part of what the players learn while playing the game is useless. On the other hand, if mastering the game mechanics is the same thing as learning the educational content, then a much larger part of what the game teaches is the thing that you actually want to teach. As a loose analogy to physics, you could talk about the efficiency of an edugame: how much of the “learning energy” that goes into a game is converted into “useful learning” and how much gets wasted? In other words, of all the things that a player learns while playing the game, how much is actually the kind of learning that we want them to learn, and how much does the player need to discard as an artificial quirk of the mechanics? As in physics, we can probably never get a 100% efficiency, but we can try to get a pretty good ratio. Of course, if you are happy with your players only learning simple things like “the President can veto bills he doesn’t like”, then you might be content with accepting even a large amount of wasted learning. A good example of a game where even a moderately high amount of “wasted learning” is probably fine was Do I Have a Right? Together with Branches of Power (which I’ll cover in a moment), this game was one of my favorites. It has you running your own law firm, and in many respects it’s similar to various real management games such as Theme Park. In the beginning you only employ one lawyer, but as you proceed in the game, you can hire more, level up your hires, buy them better equipment, purchase various extra furniture to your office to make customers happier, and place newspaper advertisements to attract more customers. The game is divided to a number of days, and after each day, your achievements are chronicled in a newspaper with a style of humor that reminds me of the writing in the various SimCity games. If not for the fact that it’s quite short, and that it won’t take very long to acquire all the upgrades, this could have been a real entertainment game. The learning component comes from various customers walking into your office and explaining their case. For example, one customer said the following: “I was found guilty of littering and paid an $80 fine. Now they want to put me on trial and fine me again for the same littering. Do I have the right to stop this trial?” You are provided a list of various civil rights as outlined in the US Constitution, and consulting it, you see that the Fifth Amendment prohibits double jeopardy. If you have a lawyer who specializes in that right, you lead the customer to that lawyer and have the case taken care of. If you don’t, you can tell the customer to come back later. Sometimes customers also think that they have rights which the Constitution doesn’t actually give them, in which case you can turn them away. 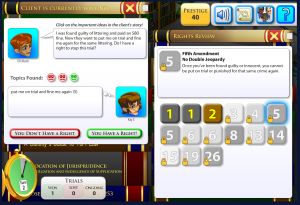 This is a quite nice way of incorporating a learning element into the gameplay in a way that feels natural and uncontrived, and is actually effective at teaching the player to recognize what the different rights are and which of them are relevant for various cases. This is much more fun than rote memorization would be, and doesn’t even feel like you’re working to learn. Also, you need to level up your lawyers and hire more of them in order to have every possible Constitutional right covered by your company, which gives you another in-game reason to spend a lot of attention looking at the various rights. 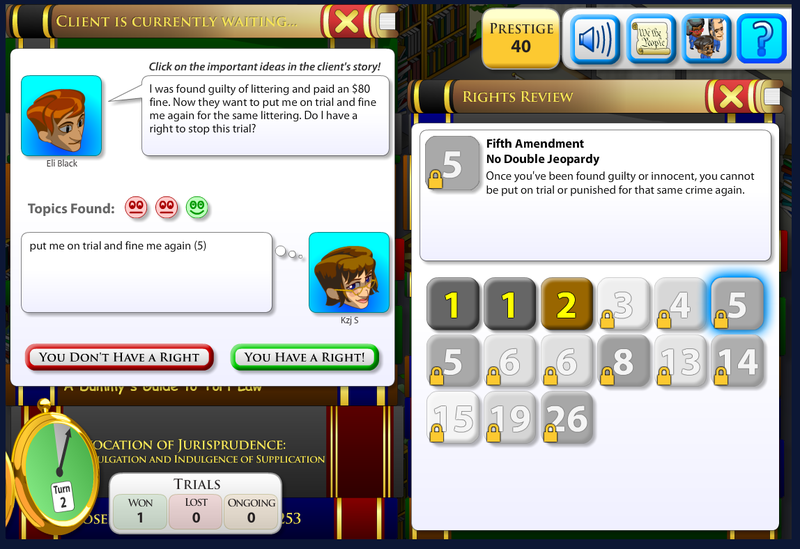 One thing that I also found clever was that you can earn a small number of extra points by clicking on the important ideas in the client’s story – in this case, the game considered “put me on trial and fine me again” an important idea, and awarded five points for clicking on that part of the text. Clicking on unimportant parts produced pictures of unhappy faces, and might have cost some points. Since identifying the right in question involves recognizing the key elements of the story and disregarding the irrelevant ones (such as this being about littering in particular), and a young player might initially be at a loss about what the relevant parts are, it’s a nice touch to put in an extra feedback mechanism that provides immediate assistance on that in particular. Another game which I enjoyed and thought was interesting was Branches of Power, in which you are trying to push different agendas into laws that are accepted by each of the three branches of government, in the following order: the executive branch promotes an idea, the legislative branch makes the idea into a bill, the executive branch signs it into law, and the judicial branch resolves any court cases that challenge it. There are ten different issues that you can try to promote, and if you can make each of them into a law that survives judicial review, you win. The interesting thing is that you can control the actions of each of the branches – but you can only control one of them at a time, and the rest keep acting independently in the meanwhile. So while you’re running the legislative branch and crafting bills in a way that will pass both Congress and Senate, the President is running around deciding whether to support your bills, and the Supreme Court is running around deciding the legality of your bills. If you want to be sure that the President will actually sign your bills, you can either engineer them in such a way that it’s in his best interests to sign them, or you can jump to take control of him and make sure that he does sign them. (At least I think that’s how it works, since I never actually crafted a bill which wouldn’t have been in the President’s interests to sign.) And of course, if you do need to take control of the president, that means that in the meanwhile, the legislative branch might craft the bills in ways that you wouldn’t want them to. In addition to being a pretty novel and interesting mechanic, which I don’t remember having seen anywhere else, this is also quite educational. Not only does it teach people about the different and partially opposing incentives that the various parts of government have, it also helps convey a more generally useful lesson: that people are more likely to do what you want them to do if you manufacture situations where their interests align with yours. That’s a very general rule about politics and human interaction overall… subtly taught in a simple Flash game in a manner which, again, does not even make the learner realize that they’re being taught! So overall, I was pretty impressed with several of these games, and felt that even some of the ones that were perhaps less successful (like Executive Decision) still had many useful lessons for edugame design in general. They’re still not very great games in terms of entertainment value, but they did give hints of how one could make an edugame that had great entertainment value. I still haven’t played all the games at iCivics, so I may do another post on them if I find more interesting ones.